I have been thinking a lot recently about how we deal with getting older. A few of us just slip into it; many of us do our utmost to keep young, whilst others live in fear of what ageing holds. I remember vividly a poignant moment when my mother, then in her early eighties, looked me in the eye and said sternly ‘don’t grow old’. She didn’t say why but I understood. Last week I visited Peter Jenks MFA show at the Michaelis School of Fine Arts in Cape Town where he questions the topic of ‘old’ age (defined as those in their 70s, 80s and 90s) by contrasting the realities of growing older with the entrenched attitudes to ageing in society. 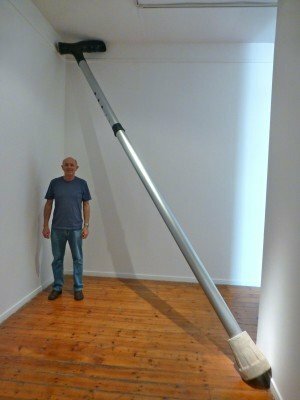 He chose to deal with this topic by making art that pits these two perspectives against each other. On the one hand, his work deals with the stigma and negative images of ageism, and on the other, the conditions and joys of growing older and wiser. What stood out for me, as I looked at and heard him talk about the pieces he had assembled for his installation was his desire to learn a whole set of new technological skills (such as 3D laser printers, manufacturing technologies and CAD) at the age of 69. The resultant larger than life pieces that he was able to make through using them, coupled with him learning them late on in his life, emphasized the tensions between ageing and ageism in a dialectical comfortable-uncomfortable way. Very clever. But there was something else that struck me, even more than his mastering the technological challenges and putting them to creative use. Not only did he craft the striking pieces, all by himself, by using the new skills and technologies, but also he demonstrated and taught the younger students on his course how to use them, showing them what possibilities they afforded to create quite different objects, artefacts and artworks. His joy at being able to share with others much younger than himself a new skill was truly inspirational. The other night I went to a dinner party where everyone was 10-20 years older than me. They all appeared to be comfortable in their skin, regaling anecdotes, chuckling about political corruption, talking about their dreams, accomplishments and aspirations while all the time knocking back copious amounts of wine. One, a teacher, having returned/retired to Cape Town after working for many years in the UK, talked of her desire to help improve the educational system in South Africa. She, like many other retired folk – ranging from teachers, nurses, doctors, chefs to accountants – still have so much they want to do in life and give to society. There is a website called The Amazings that offers “classes, courses and wisdom from elders with amazing life experience”. Paul will teach you wood turning, Laura corset making and Dot knitting using a loom. They are all over 50 (that is not old! ), “a band of men and women fighting against the idea that older people should go quietly towards the dying of the light.” All great stuff. But I want to do something a bit different. Part of what I plan to do this year, as part of my dream fellowship, is run workshops with older people who are active in their communities (such as the U3A – University of the Third Age) and have an interest in technology. My idea is to set up a series of whiz-domes, where older people come along for a day or two to learn and experiment with an easy-to-use technology toolkit for a particular theme, such as food, safety, learning or freindship. The hope is that this combination can galvanize them into thinking creatively and constructively, in ways they can share their knowledge, concerns and joys. The idea is to provide them with new opportunities and to see what they might conjure up. My prediction is that older people will engage with these kinds of toolkits in ways that are quite different from how kids or students would, by tapping into their wisdom. Possibly even more creative. The toolkit I plan to use is MaKey MaKey, which turns everyday objects into touchpads. 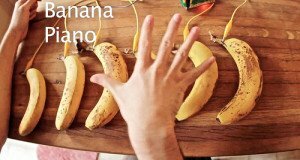 In a nutshell, it is a “simple Inventive Kit for anyone interested in art, engineering, and everything in between.” An example of what you can make with it is the banana piano – instead of using the computer keyboard buttons to play the piano, you hook up the MaKey MaKey to some bananas, and the bananas become the piano keys. One of the blurbs on the home page says, “my four-year-old daughter has managed to connect the kit”. Just imagine what another eighty years of wisdom might do.